Yesterday, July 10, was Teddy Bear’s Picnic Day. The neighbourhood bear decided he would be a taste tester, having a few practice runs to check out what dishes I was serving from my green bin. I think he wanted to make sure things would be perfect for picnic day because he’s come back, three times just to make sure my culinary skills were up to his expectations. The first night he showed no fear of us. As a matter of fact, he turned towards us and sat back on his haunches, raised his front paws and basically said come and make me leave. We shouted and banged on our deck, but he didn’t seem as if he was going anywhere. After 20 minutes, something must have finally spooked him and he took off down over the bank beside our garage and into the woods. Unfortunately for him, the green bin had been emptied that morning and there wasn’t anything yummy inside. The second time he came back he worked feverishly for 5 hours banging the bin on rocks until he finally cracked the top enough so it would give when he pushed down on it. This allowed him to slide the previously too tight ratchet strap over to one side of the lid and get his paw inside to sample the buffet being offered. No amount of lights lit around the property or shouting at him or making all kinds of noise made him leave the gourmet feast. He slid the green bin beside a small car parked beside our garage so we couldn’t see him and every so often he would look around the edge of the car to see if we were still on the deck. We watched for a bit while he bashed the bin against the rocks but eventually we closed the door and went to bed. He made so much noise we didn’t get much sleep until he was finished feasting around 4 am. When he returned for his third sampling, he arrived at 6:15 am. I heard the green bin moving over the gravel in our driveway. I assumed it was my father, dragging the green bin out to the end of the driveway for collection because it was collection day. When I got out of bed an hour later I looked out the windows in the front of the house and couldn’t see the bin at the end of the drive. When I questioned my father about where he put it, he said he hadn’t put it out yet. We both went to the back door and sure enough the green bit was not where it was supposed to be. 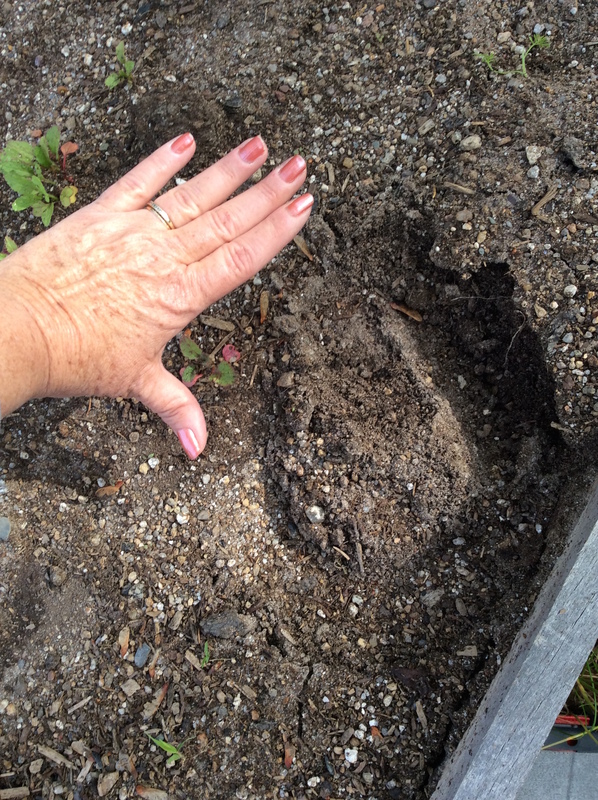 The bear had drug it in a different direction this time, across in front of the little car, scratching the front fender and then his path took him through our vegetable garden. Our plants were all uprooted and laying on top of the stirred-up soil. He took the bin to a little flat spot just beyond the garden, and by the look of the the way the grass was all flattened and the things he didn’t like in the bin were strewn around, I’s say he enjoyed his breakfast. I’m sure he was particularly happy this week because his meal included local strawberries and whipped cream for dessert! We were not sure quite how big he was because we never got a clear look at him with the little car between us and the fact he’d come at night the first two times, and then he was gone when I realized he’d taken the cart on Friday morning. However, that all changed on Friday night. A friend and I were sitting on the back deck in our screen gazebo around 8:30 pm. All of a sudden, this thump – de – thump sound came from the side of the deck. We turned to see what the commotion was. There was the bear running down the side of the deck and heading towards the woods at the back of our lot. We were both too shocked to say anything as we watched the bear speed past. Once he disappeared we both turned to each other and yelled “BEAR”. We quickly headed to the patio door and into the house. We laughed about our response to his streaking through the yard for the rest of the evening and all-day Saturday. Right on Schedule he showed up sometime through the night last night to picnic on his special holiday. We’ve since added another ratchet strap to the top so he was unable to get the bin open. His patients must have been limited because he left without dragging the bin off or making too much of commotion. I didn’t even know he was here this time until I got up and saw the bin lying on its side. I’m sure he was disappointed. I’m hoping the second strap has frustrated him and he’s decided to move on to a place with far better culinary delights and easier access to them. I don’t have any pictures of the bear because I was too stunned to get my phone up and take one, but here is a picture of his paw print in my garden. He certainly is a big guy but don’t think his size slowed him down. He was running faster through the yard than I could have.